Allan, Dale and Geddy get together on average 4 to 5 months before the start of a tour to start planning the video portion of the tour. Geddy works with the band on the setlist, we�ll get a whole bunch of songs, could be this, could be that, could be this, from there we decide which songs have existing visuals and which songs we may want to do visuals for. Recently we have this kind of standard, we have an opening, an intermission, and a closing video for the show. It usually takes a month or so to get to the point where we actually have an idea of what we want to do! The three of us kind of play a game of ping pong, what about this, what about that, ah that�s a great idea, what about this, kick it around until we find an idea that is fertile! Dale will take it away, write it up in some kind of loose form, then we get back together it�s like one lump of clay that the three of us kind of massage. When Geddy feels it�s cool enough to show the band he shares it with Alex and Neil and they comment on it, add their points of view and their humour. If need be, Alex joins us at the round table so to speak, in the creative summit and rounds it out even further. It�s hard to include Neil in the early process because he lives in LA, he gets the updates from Geddy. An interesting part of the process is once we find the story we put it into a script structure, start, middle, end. The initial dialog is really just a place holder in the script, the final dialog we actually work out with the band because all three of them are fantastically funny! When we shot it, because we had to have eye line, Geddy was Geddy and Allan played the eye line for Harry Satchel and I kept giving him the wrong lines just to mess him up, then Allan played Geddy and Geddy played Harry Satchel for the split screen. That kind of started the ball rolling having these funny comedic narratives to start concerts and to have the band as actors. On Snakes and Arrows we had Alex in bed waking up from a bad dream and waking up his honey, it turns out to be Neil much to their mutual horror in the video, but they do have fun and enjoy making the videos! One funny video was when we did �What�s that smell� the reprise of Harry Satchel. Neil was in LA and not too anxious to fly to Toronto to do this one little film thing, so we said ok and we made him into a GI Joe on the drum kit! We already had the Barbie dolls as Alex had them in front of him on tour, the crew would put different signs in their hands each night telling Alex, �You�re great�! Another funny scene was when we shot the end for Snakes and Arrows, with Harry Satchel telling all the punters to go home, you hear all the chairs and glass breaking as the crowd leaves, the look on Alex�s face when he is in the box relieving himself, Jerry Stiller�s head saying, �Well this is Stupid�. We also have Neil in a box with his head on a pillow while the Barbie dolls are harassing him. Originally Allan and I were going to puppeteer the Barbie dolls then we thought it would be much better if we had Alex and Geddy puppeteer the dolls. We get Alex and Geddy to puppeteer the Barbie dolls, saying things like, �you�re so cute�,� I�m from Brazil�, all the while kissing him! Seeing these super talented musicians, these legendary guys making these dolls talk it was such a funny scene and Neil was so comfortable and laughing with it. The challenge in filming is we need all three guys. The process for them in terms of rehearsal is that once they do get to a point where they all agree to a set list, Neil goes into rehearsal in LA, and then he comes up here, we need to find a window of opportunity when they are in rehearsal. They rehearse for about a month or so in Toronto, usually a week or so into that we find a weekend where we can get them away and into a studio. For Time Machine the production was over a three day period split over two weekends. Two days in the bar and one day in the studio, a green screen day. The bar was an existing location that was an abandoned set right across from the old Cherry Street diner. We shot a bunch of stuff on the first day that didn�t focus in so much on the dialogue, what we let them do is muck around and have a good time while the script assistant person took notes of everything they said. At the end of the day we review the notes, oh that�s fantastic, oh that�s fantastic, and assemble that into a script. and what they said was so much funnier so eventually we just stopped bringing in a writer! The next day we meet with the guys in the trailer to review the script. So by the end of day two we have assembled all their best improve lines so ideally the dialog is theirs! For Time Machine it was a very, very, very hot during the two weekends in June. 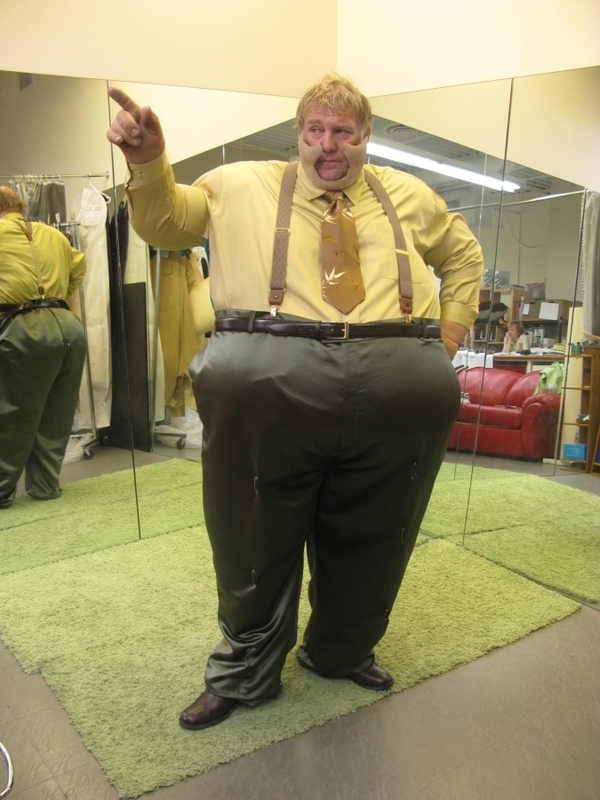 For the Haus of Sausage shot Alex was wearing the fat suit and in between takes had to go into a separate room that had air conditioning, he would have the fat suit propped up and used fans to try and cool himself off. It was the next weekend at the studio, green screen day, that Alex nearly fainted from dehydration he had a lot of takes combined with the heat he nearly fainted as we couldn�t keep him hydrated enough. 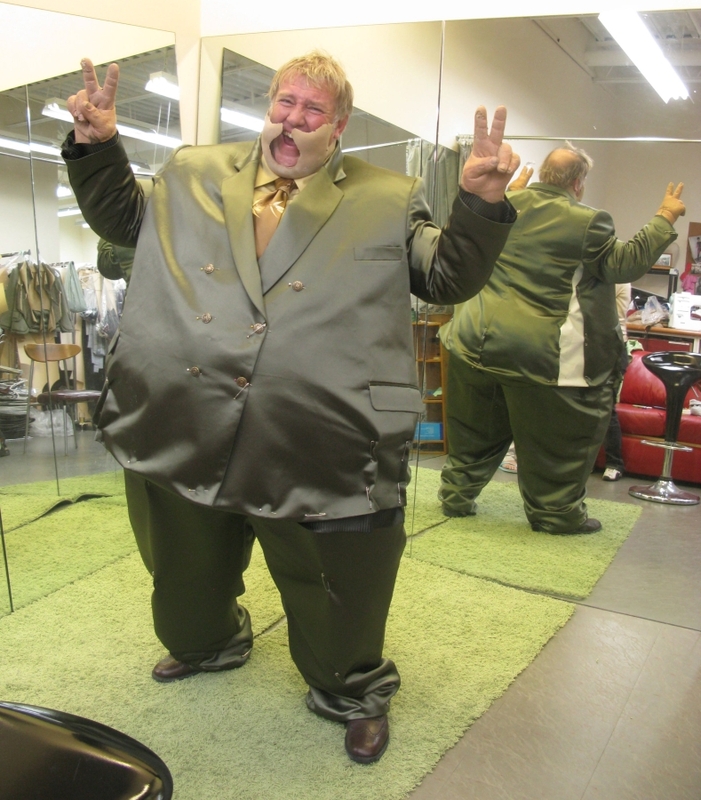 After that he was not too anxious to put on the fat suit. You always hear that kids and animals are the worst to work with. We were dealing with babies, kids, and a chimpanzee, we were prepared for a nightmare morning, prepared to be able to contain it if all hell broke loose. As it turned out Susie the Chimpanzee was the easiest part of the shoot, she was a total pro! The chimp guys were from LA, they were unbelievably professional, they came in an introduced themselves and asked for 10 minutes with crew. They laid out the ground rules for the chimp as not to freak it out, no photos, no cell phones, no quick movements! 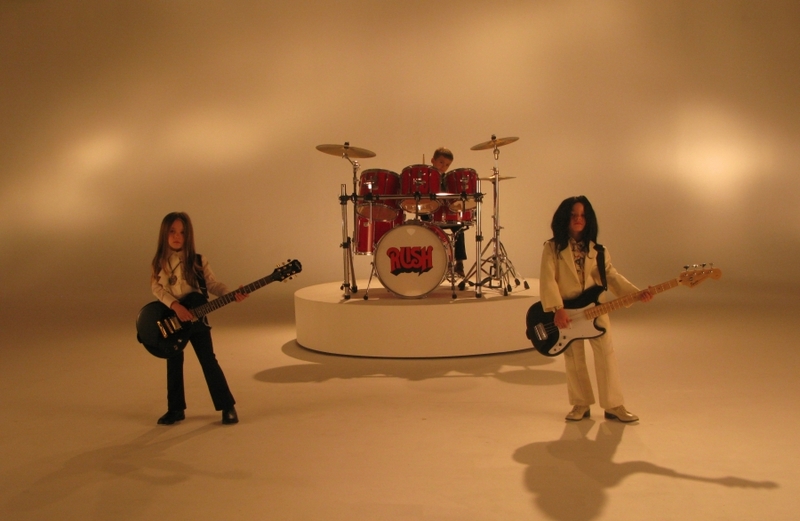 The Chimp came in played bass, drums, and guitar� was done in 30 minutes� amazing you put on some glasses, a Neil beanie, you turn into a member of RUSH! Alex looking pretty happy in early stages of the fat suit! Lou Pomanti is the musical genius behind the different variations of the Spirit of Radio. We had such a fun time with Lou, he brought in all these talented players, we laughed all day. Geddy came in around 3 o�clock and in two takes sang fantastic vocals for the country guy, for disco guy! It was fun watching Geddy he loved the different styles, his smile was ear-to-ear doing this stuff! For Time Machine we had talked to John Hamburg, writer and Director for �I Love You, Man�, we asked him about writing parts for the real history of RUSH which he didn�t feel comfortable with but offered to write the ending film. I can get Paul Rudd and Jason Segal to recreate the roles from the movie, so John wrote that script, we went to LA and put the production together around him. 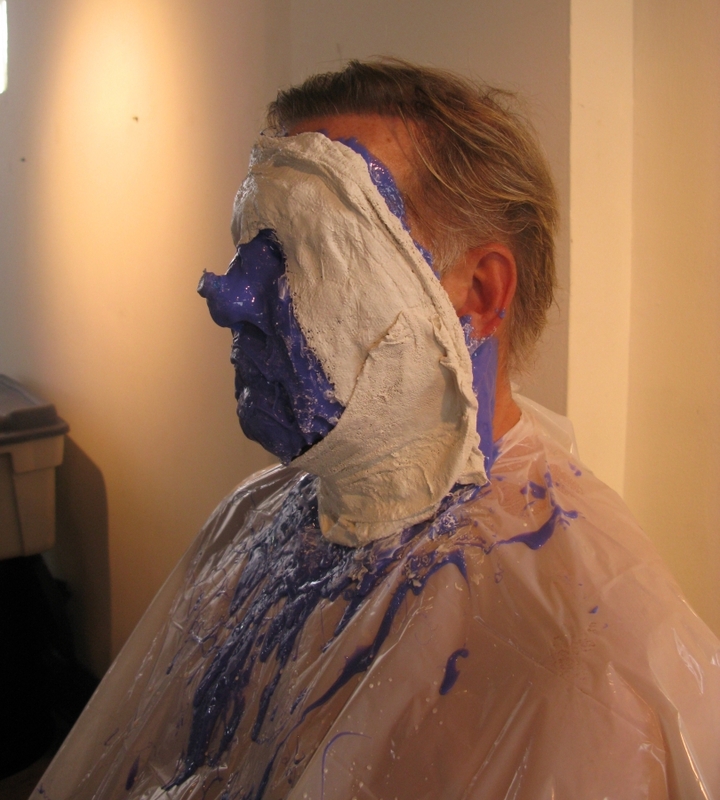 The hard part was finding green rooms (like dressing room, not to be confused with Green Screen), Universal had built an entire studio for Conan, and the show was cancelled when Jay Leno decided he wanted to take over again, so we filmed it in the abandoned studio. For the Clockwork Angels tour we meant to explore the Steampunk theme. We wondered how do we represent that in the opening video, Dale came up with this backstage journey and figured out what would be the gags, Scott inflating Alex as he�s too big, Geddy getting his neck stretched by Skully, and Neil as a robot as he always jokes that he is like a robot, with Gump putting Neil back together. There�s a Geddycorn that comes down in the elevator. There was an extension for the opening that in the end we decided just didn�t flow, it�s an animated piece that we think is fantastic, it�s included as an extra on the DVD. Geddy�s daughter plays Koogle in the opening time machine video which she must have enjoyed as she is studying acting at University in the United States! Dale�s 7 year old daughter plays the guitar in the intermission time machine video. For the intermission video Jay Baruchel and the guys start to improvise, they are fantastic improv guys and you add a genius actor in Jay who really is a super talented chameleon type actor, he is the perfect fourth guy to play off these guys! Not sure if anyone has caught it on tour or not, not sure if it has shown up on RIAB or not, pay close attention to Carnies on the DVD, at a point of time on the rear screen, there is a two headed boy which is Alex and Geddy and the bearded lady is Neil and they move, at one point the bearded lady swats a fly! Neil, when he heard about it he insisted that he be the bearded lady! We knew that Geddy and Alex had to be the two headed boy but we were not sure about Neil, when he heard about it he insisted that he be the bearded lady. We wanted to have the old style posters you see at carnivals for the Carnies song. You will also see Neil as the bearded lady in the background of the opening video. How do you determine when you are going to film the live Clockwork Angels show? We wanted to do it on first leg of the tour with Orchestra, and do it later in the course of the tour so that everyone knows their parts. The cost prohibits bringing the full crew and setup for multiple shows, however the band has their own video crew which we can use feeds from. The main show with the full crew and setup was done in Dallas, however we do have complete video from the San Antonio, and Phoenix shows. 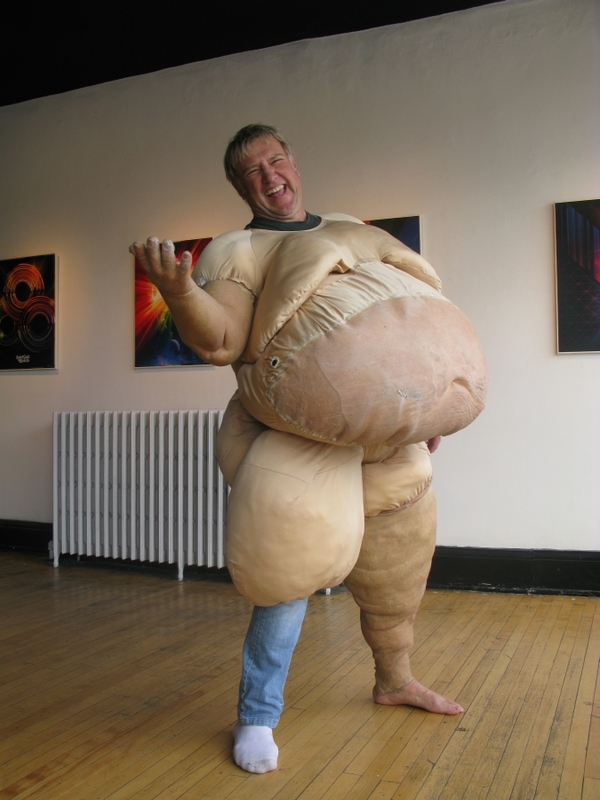 Alex Lifeson, or is it Shlobovitch, fat suit almost done! Do the cameras film all of the time during the show or just certain segments as directed by the Director? The cameras are filming all the time, cameras are continuously shooting, but shooting their specific locations. In the old days you would do a line cut, the script assistant would say what is coming up and the Director would cue the cameras. We now slave all the cameras to a hard drives. Andre, Dale and Allan went to different shows to take pictures of the kind of shots they wanted. One sheet showing where the camera operator can go and the kind of frames we wanted them to get. From this a bible was created, here�s the layout of the venue, the stage, the three levels of seating. Each camera has their position; you�re going to go from here, to here, to here, we call their sandbox. Once the show begins it�s really intense, your sphincter tightens right up, you drink tons of water, you talk like crazy! The Director of photography determines the exposure levels, cameras have to be white balanced to the same degree, also what stop they are going to run at. You have to colour balance all the spots, warmer, cooler, spots are too bright for camera, for a live audience they are fine but for camera they are completely blowen out. When you adjust the exposure ratio everything behind them goes completely dark, for the DVD you need to create a nice balance. The only time you can really do that is just prior to sound check because you have all of the spot operators around and you have actual people stand in place representing the band, for some reason Allan always has to stand in for Geddy on the stage! Howard Ungerleider works closely with the director of photography and has to make adjustments to the lighting as required. During the show, Dale, Allan and all the camera operators are on headsets. Dale is watching the live feeds on monitors and talking to the camera operators to ensure they have interesting framings, but also make sure they don't have the same shots. The worst thing would be if every camera is pointing at Geddy and we don�t have any alternate shots. Once the show begins it�s really intense, your sphincter tightens right up, you drink tons of water, and you talk like crazy! For Time Machine you had this cool Zeppelin that moved around the whole arena how did that work out? It was OK, the concept was great but the camera wasn�t up to par. Lilah Heslip, Dale's daughter playing an early Alex Lifeson what a thrill it must have been for her! What about the sound for the DVD? We use Music Mix Mobile based out of New Jersey. M3 are considered among the best in the industry winning recent awards for The 52nd Grammy Awards and the 25th Anniversary Rock and Roll Hall of Fame Concert that a few reading this article were more than likely at! M3�s Joel Singer does all the big shows and together with Rich Chycki who manned the dials, looked after the 50 tracks, and additional microphones used for the audience. Rich and Joel�s experience proved invaluable when it came to recording an audience and in obtaining a great 5.1 surround-sound! On filming nights there are three sound feeds, one for monitor (feed that Alex, Geddy, and Neil hear), one for the front of the house (what we hear) and one out to the M3 truck (for the DVD). What is the size of the DVD crew on the day of the shoot, what are some of the difficulties? R30 had 40-45 crew members, Time Machine and Clockwork Angels about 30-35. You have to feed them all, we need our own rooms, there is lots of negotiation between Craig Blazer (CB) and Allan. Catering is all there, it becomes a matter of how we are going to divide and conquer time and space. Some venues only have two bays, how is the DVD crew going to get their stuff in and out, especially at the end of the show, the band�s crew needs to get the band�s stuff out of the venue for the next show, the DVD crew needs to find another way to get their gear out without interfering with the band crew. It�s all coordination, we have to work pretty close with CB to make sure it all goes off flawlessly; ultimately it comes down to the three plus hours, it has to work perfectly! For wrap up everything has to come apart quickly so we can get out of their way. Part of the challenge is the physical space, it�s gigantic, you can�t just run from here to there to have a conversation with somebody, you have to walk across an entire stadium or find them on headset, sometimes the RFs are crazy, it�s buzzy you can�t really hear stuff! You may be on one side of the venue working on an issue and then you have to talk to the band, once the crowd is in you are confined to running through the outside perimeters, Allan puts in a lot of miles! What about the band, do they get pumped up? Allan�s job is to make sure the DVD process does not interfere with the show, kind of an invisible process. They band does their regular routine. Allan goes in to talk to them, let them know the DVD crew is all set, check on any last minute things. In the case of Clockwork Angels they were subbing songs in and out, one of the few times they had an A and B set list. Allan wanted to have all of the CA songs in one night, so had to negotiate with the band to add the extra song, they agreed which was good, but afterwards complained one more song was so much harder to do, but they did it. Otherwise it is like a normal show, we just try to get out of their way but they get pumped, they know that they have to add a little extra because we are filming everything. Alex was not feeling well, the night of Dallas, we found out after the show we went back for a glass of wine with Geddy and Alex wasn�t there, but during the show you would never know, he is such a pro! For Clockwork Angels we follow the band on stage, we hang out with them at the beginning, and we follow them off stage after sound check, the whole idea of this DVD is we are crossing the line, kind of showing what the crew is doing during the show. We were trying to figure out how we were going to end this thing, it might have been CB�s idea, you know at the end while Geddy is talking, Neil books it to his bus why don�t we have the cameraman chase after him! It�s a long show the cameramen are working for hours, they shot sound check, a bunch of miscellaneous stuff, the first set, shot stuff during intermission, the second set, now the steady cam guy has to follow Neil after the show. Keith Greenwood has had this steady cam on his shoulder for hours and hours, the shows coming to an end, are you ready to go, I�m ready to go, Neil runs at 100 miles per hour as the steady cam tries desperately to follow him. We go backstage and have a laugh with Geddy, we got it, we got Neil running to his bus, Geddy remarks you probably missed the best part, the female security guard said, �He runs faster than Britney Spears!�, as Dale and Allan are leaving the venue, they bump into the security guard, Dale runs to get a camera to film her saying her great line! Post Production takes a couple of months to cut it, a couple more months to go through the whole authoring process, and determine what the extras will be. Over all it takes about three to four months! For the sound Alex works with Mike Fraser and Andy Curran who is the ears for the band. Clockwork Angels was a little more complicated with the addition of the strings. The strings and Alex�s guitar are in the same frequency, it became a matter of you have to hear Alex�s guitar and the strings, you find that balance until it works! There�s a mix done, the band signs off on that, and we re-marry it back to picture. We all came to a happy medium, the band is happy with the sound of the show and we were able to get the strings at a level that it pays off from a visual stand point, you find that happy place where everybody says that works. How was the experience working with the strings? The band loved it, the strings had a great time, it was all very well received, visually it looks great, and Audrey has her own fan club. Neil actually said, he saw signs at a couple of shows: "We came for Audrey!" Neil actually said, he saw signs at a couple of shows: "We came for Audrey!" 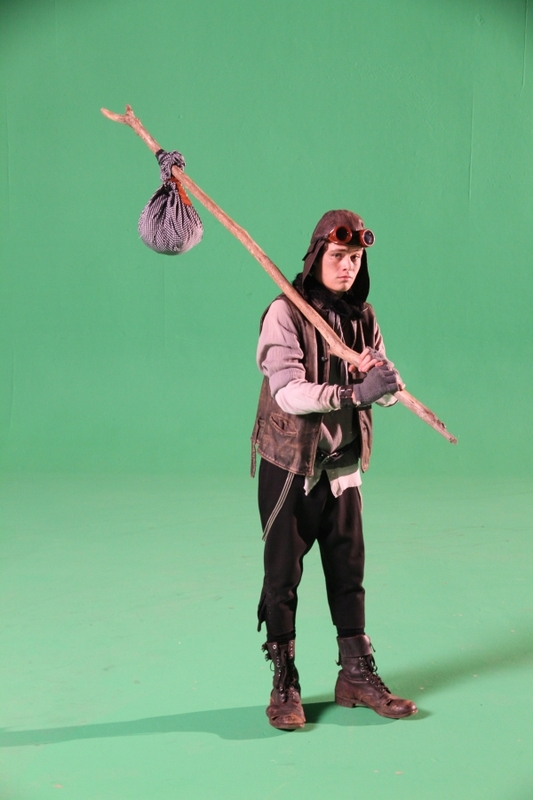 Lucas Heslip on the green screen set for Clockwork Angels, recognize the character? Lucas was the runaway kid that the tax man views through the telescope! How many people involved in the post process? Usually there is an Editor, assistant editor, and a post producer. For this DVD there were three editors, one for the first set, one for the second set, and one for the intro video. Aaron Dark (who worked on the Time Machine DVD) and Mark Morton (who worked on RUSH in Rio, R30 and Snakes and Arrows) shared the editing for the first and second sets, they kind of divide and conquered the show up, not sure if they drew straws to see who would work on what but it was a cool process they kind of worked off of each other, they would show each other the edits and kind of inspire each other, we would go in for screenings and make our comments, we kind of like that cut better than that cut, be a little gentle about it, the cutting process is long, finding the rhythm for each song is very time consuming process, the volume of media is huge. Lauren Picbe is the assistant editor, we brought her in as our digital media management person on the day of the shoot, we had her there from the very beginning, she has to maintain it all, we also had her cut the four bonus songs, the four songs not actually shot in Dallas but were part of the tour, they became bonus material on the DVD. In the end there were 4 different editors cutting all of the video we shot for the show. One of biggest compliments we had was when Geddy came in for the screening he had very few changes in fact his comments were more on audio rather than the video which is really cool! Clockwork Angels has a nice and different vibe, different from the other shows. The show looks fantastic visually thanks to Howard�s production. One last note, Alex and Geddy's backline was designed by Dale, Greg Russell in L.A. designed the drums with Neil. For the videos, the costumes were a collaboration with Trish Venema and the previously mentioned, Andre, is Andre Pienaar the Director Of Photography (DOP). Gnomes and Trolls the Watchmakers Underground Creatures! 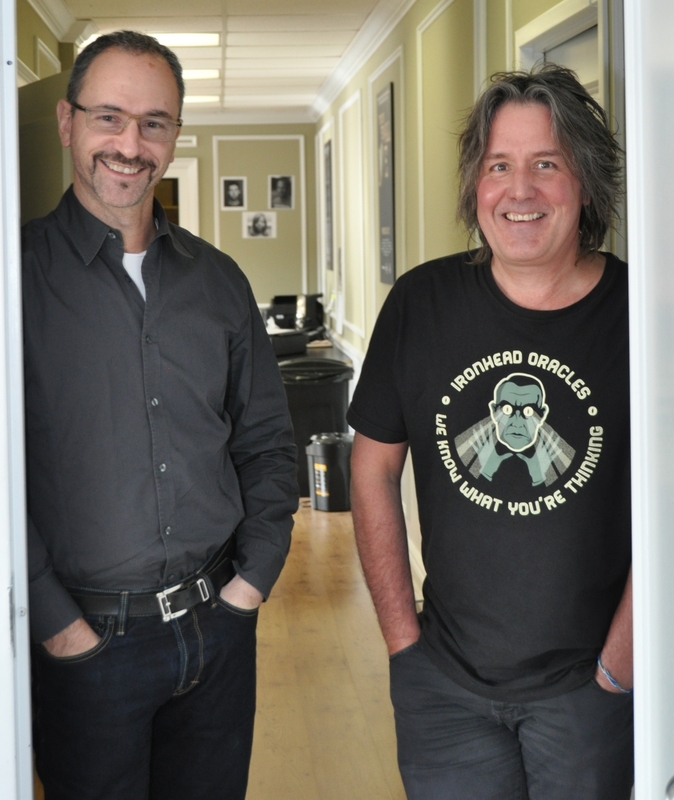 and picture of Dale and Allan at Fadoo, taken by Paul Beaulieu. videos and filming of a tour show, and the great pictures that I am sure all RUSH fans will enjoy! It was an most enjoyable experience, I could have listened to you guys for another couple of hours!